Sargent first visited Majorca in the summer of 1908 and then returned with his travelling companions, Eliza Wedgewood and his sister Emily, for a more extended stay in September. He stayed at Villa Son Mossenya, an old house in the picturesque village of Valldemossa on the mountainous western side of Majorca. Eliza described their experience on the idyllic island, which extended until late November, as being "ideally happy." Ilex Wood, Majorca was retained by the artist until his death. When first exhibited in 1948, the painting was praised by the critics for its "tapestried weavings of forms and colors into a brilliant expression" and as Sargent's "private summation of Impressionism." But as Vernon Lee has argued, Sargent was not an Impressionist; rather than capturing the fleeting nuances of light and colour, the artist was concerned with the empirical reality of nature. "Thus I remember, " she relates, "Professor Geddes remarking that Sargent's Alpine sketches showed a geologist the composition of the rocks and the manner their shapes had been modelled by water and ice and sun and wind. And Sargent was not a geologist. Similarly, no doubt, with his portrayal of vegetation. So far was he from the complacent Impressionist formula of representing things without knowing what they were!" Although seen as early as 1886 in his flower subjects painted at Broadway in Worcestershire, England, while at Majorca, Sargent returned to close-up views of foliage or fruit in which the horizon or sky is virtually eliminated. In Pomegranates, Majorca, 1908 (Private collection); Pomegranates, 1908 (Private collection); Study of a Fig Tree, 1908 (Private collection); and Gourds, 1908 (New York, Brooklyn Museum of Art); as well as Ilex Wood, Majorca, the forms of the fruit or leaves, while retaining their substance, are incorporated into an almost abstract pattern of brushstrokes. 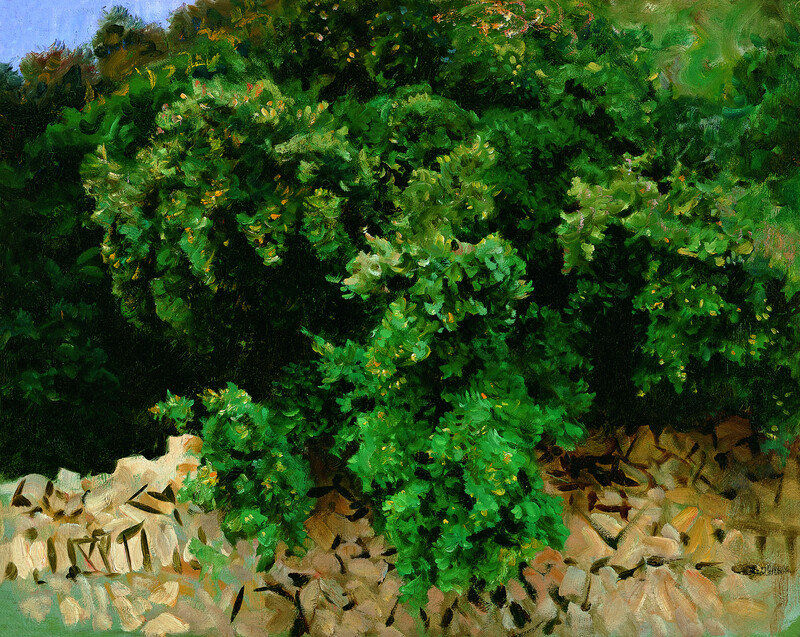 In Ilex Wood, Majorca a hint of sky is seen in the upper left, the holly-like plants are rendered in a rich chiaroscuro, while the rocks of the stone wall, which is also seen in Valldemossa: Pomegranate Trees, 1908 (Private collection), are reduced to decorative calligraphy.